Verb tenses tell us when an action took place in the present, past or future. Help your child understand the main verb tenses (simple present and present continuous, simple past and past continuous, simple future and future continuous) and understand which tenses are used in different kinds of texts. Verbs are words which express actions. The tense of a verb tells us the time when the action took place, in the past, the present or the future. There are three main tenses: present, past and future. I walk into the monster's cave. I am walking into the monster's cave. The present tense is made up of simple present / present simple (actions which happen regularly), present continuous / present progressive (actions which are taking place now) and present perfect (actions which are now completed). I walked into the monster's cave. I was walking into the monster's cave. 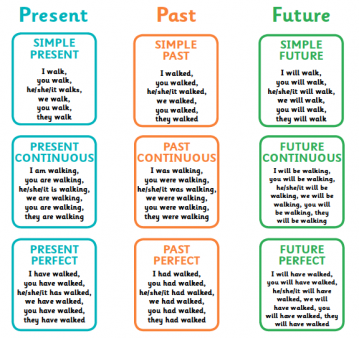 The past tense is made up of simple past / past simple (actions which took place at a specific time and are now finished), past continuous / past progressive (Actions which took place in the past over a period of time) and past perfect (actions which were completed by a particular point in the past). I will walk into the monster's cave. I will be walking into the monster's cave. The future tense is made up of simple future / future simple (actions which will take place in the future), future continuous / future progressive (actions which will take place in the future over a period of time) and future perfect (actions which will be completed by a particular point in the future). Children will learn to distinguish between verb tenses in KS2. They will also look at the subjunctive in Year 6, and be introduced to irregular verbs. When a child is writing a story, they need to make sure that whether it is written in the past or present tense, the tense is kept consistent throughout. I woke up on a sunny morning and ran excitedly into the kitchen. My mum was making me pancakes, my favourite! She laid a pancake on my plate and I picked up the maple syrup and squeezed this all over the top. I roll up the pancake and stuff it in my mouth: it is delicious! Here a child would be expected to read through the start of the story and think about which tense the story was written in. They would then need to change these underlined verbs to 'rolled', 'stuffed' and 'was' to keep the story consistently in the past tense. Children will be reminded about tenses when they write fiction and non-fiction texts. When they write a fiction text, they will need to remember to keep the tense consistent (that is, if they start writing in the past tense they need to stick to that throughout the story). When writing non-fiction texts, they need to remember to keep to the tense shown in the texts they have studied. Present tense would usually be used for instructions, information texts, reports and explanations. Past tense would usually be used for recounts, biographies and autobiographies. Persuasive writing, journalistic writing and argument texts could be a mix of tenses (for example: an argument text might give an argument in the present tense, backed up by a fact in the past tense).